Nuclear/Cytosolic Fractionation Kits | Cell Biolabs, Inc. Cell Biolabs’ Nuclear/Cytosolic Fractionation Kit provides a simple and fast tool to isolate nuclear extract from the cytoplasmic fraction of mammalian cells. The procedure has been optimized to provide extraction, with high protein recovery and low cross-contamination, in less than 2 hours. The extracted protein fractions are functional and suitable for downstream assays such as DNA footprinting, RNA splicing, gel shift assays (EMSA), reporter assays, enzyme activity assays, and Western blotting. Figure 1: HEK293 Cell Fractionation. Cytosolic and nuclear protein extracts were isolated from Human Embryonic Kidney 293 cells according to the Assay Protocol. 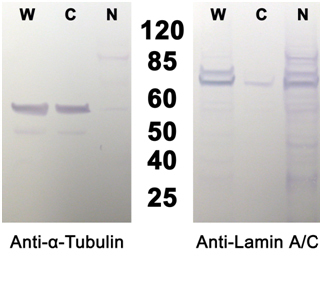 Whole cell (W), cytosol (C), and nuclear (N) fractions were immunoblotted with Anti-α-Tubulin (cytosol-specific protein,left) or Anti-Lamin A/C (nuclear-specific protein, right) at 1 µg/mL. Figure 2: HEK293 Trypan Blue Staining. Human Embryonic Kidney 293 cells were stained with Trypan Blue at various steps during the fractionation protocol, demonstrating complete lysis and high neuclei recovery. Davis, M. R. et al. (2016). Epigenetically maintained SW13+ and SW13-subtypes have different oncogenic potential and convert with HDAC1 inhibition. BMC Cancer. doi:10.1186/s12885-016-2353-7. Nakamura, S. et al. (2015). Novel roles for LIX1L in promoting cancer cell proliferation through ROS1-mediated LIX1L phosphorylation. Sci Rep. doi:10.1038/srep13474. Shinmura, K. et al. (2015). NEIL1 p. Gln282Stop variant is predominantly localized in the cytoplasm and exhibits reduced activity in suppressing mutations. Gene. doi:10.1016/j.gene.2015.06.043. Jeon, Y. J. et al. (2015). A set of NF-κB–regulated microRNAs induces acquired TRAIL resistance in lung cancer. Proc Natl Acad Sci U S A. 112:E3355-64. Ohtsuka, S. et al. (2014). SQSTM1/p62/A170 regulates the severity of Legionella pneumophila pneumonia by modulating inflammasome activity. Eur J Immunol. 44:1084-1092. Zou, J. et al. (2014). A TIR domain protein from E. faecalis attenuates MyD88-mediated signaling and NF-κB activation. PLoS One. 9:e112010.